Venezuela‘s self-proclaimed interim president Juan Guaido presented the opposition’s broad vision for the country’s future on Thursday, as the political crisis in the country deepened. “We have a plan, well thought out, structured,” Guaido said at the Faculty of Economic and Social Sciences in the Central University of Venezuela on Thursday, noting that “it is the sum of many sacrifices”. The “National Plan” focuses on the opposition’s vision for the economy and oil resources, but it also tackles public services, security, governability and society. “The armed forces also have a role in the reconstruction of the country,” he said. Last week, Guaido swore himself in as interim president before a crowd of his supporters. The proclamation came after the opposition-controlled National Assembly declared President Nicolas Maduro’s second-term “illegitimate”. Maduro accuses Guaido of leading a US-backed coup, and says the United States, among other countries, are waging an economic war aimed at removing him from power. In Thursday’s speech, Guaido divided the plan into three phases: the “cessation of the usurpation”, the establishment of a “transitional government” and free elections. According to Guaido, the priorities include the coordination of humanitarian assistance, the restoration of public services and an effort to tackle people’s dependency on subsidies. 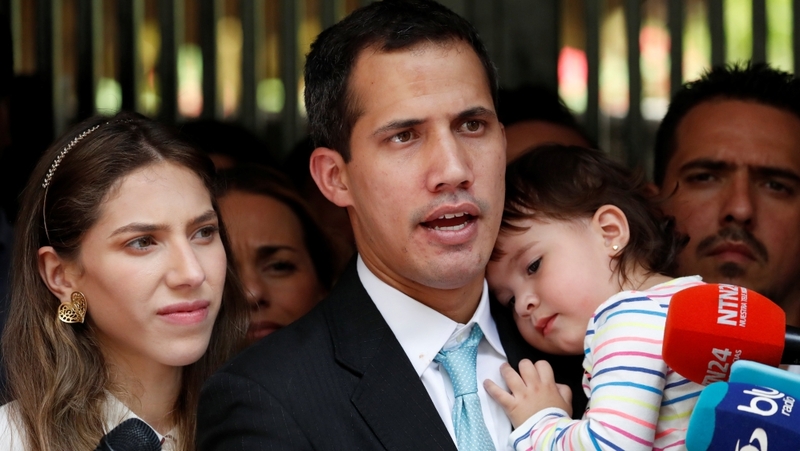 “I will hold you responsible for any threat that you could make to my 20-months old daughter,” Guaido said. The US, which backs Guaido, has warned of “serious consequences” if Maduro’s government harms him. Neighbours said men who identified themselves as belonging to the FAES arrived at the gate of his apartment building in a white SUV. There was no obvious police presence by the time journalists arrived at Guaido’s house. On one side of the tussle for control of Venezuela – an OPEC member with the world’s largest oil reserves but in dire financial straits – Guaido and Western backers led by the US are insisting on an immediate transition and fresh elections.